Unfortunately, I cannot tell you if the "Western" diet was also full of junk food. I just know that its 20/55/20 ratio of PRO/CHO/FAT is everything but ideal for one's body composition. While it has not officially been published, yet, I am pretty sure that Jacob M. Wilson's latest paper is going to be one of the most-downloaded articles in the upcoming issue of the Journal of Strength and Conditioning Research it's about to be published in. You're asking yourself why I am so sure about that? Well, it's already the most-discussed ahead-of-print article in months (see any Facebook Fitness / Exercise Research group or bulletin board), because it claims to confirm that ketogenic diets "can be used in combination with resistance training to cause favorable changes in body composition, performance and hormonal profiles in resistance-trained males" (Wilson 2017) - a claim that gets both ketophiles and keto-haters absolutely fired up. Would be interesting to compare keto to high-protein, not western diets, right? "the KD [ketogenic diet group] would decrease body fat to a greater extent than a WD [western diet] group, while maintaining skeletal muscle hypertrophy, strength, and power" (Wilson 2017). The glycogen loading was not meant to skew, but to create a level playing field. Unfortunately, this strategy backfired in a way that's currently getting people all over the interwebs so "excited" (to say the least) that they focus exclusively on this failed attempt to compensate for the glycogen advantage and do not acknowledge the strengths of the study. Update from April 21, 2017: You can read more about the study from the authors themselves if you want to. Ryan Lowery also addresses the "glycogen loading" making practically the same point I did: anybody who would have invested time and effort to read the whole paper, would have read that they never claimed the aprupt increase in lean mass in the final week was anything but water. Strengths such as (1) the selection of trained subjects and exclusion of those with a squat performance that was significantly below 1.5 times the subjects' own body weight (here we have one of the criticized issues with the reporting, though, because the value Wilson et al. provide is 1.56 ± 0.14 and thus below 1.5 if you subtract the standard deviation from the arithmetic mean), as well as the prescription of (2) a realistic resistance training routine with a hypertrophy focus (see Table 1). Table 1: Training protocol; *rest was 60-90 seconds on hypertrophy days and 3-5 minutes on strength days (Wilson 2017). Extra cardio or other endurance training and/or other athletic activity outside of the three weekly workouts was strictly prohibited. All exercises were either performed for the given number of reps or to failure. The load utilized for weeks 3-6 ranged from 65 to 95 % of subjects’ initial 1RM. However, these loads were increased by 2-5 % for the final 7-9 weeks of training depending on subject’s ability to perform the prescribed repetitions during weeks 3-6. Figure 1: Visualization of the macronutrient composition of the diets (Wilson 2017). As the authors explain, the "subjects tapered by decreasing volume by 40-50 % through decreasing sets on auxiliary lifts on Monday and Wednesdays and only performing 1RM testing on Fridays" (Wilson 2017) in the final two weeks of the study period, of which it may be worth mentioning that it lasted 12 weeks: a two-week lead-in, 9 weeks until the highly debated glycogen repletion protocol began and another week until the final measurements of exercise performance and body composition. How different were the diets in reality? Unfortunately, the researchers don't elaborate (and probably didn't even review) which foods their subjects actually eat. Accordingly, we're left with the macros and some extra information on the saturated, poly-, and monounsaturated fat and fiber content of the diet. What I can tell you is this: the average protein intake in both groups was identical, amounting to ~130g/day; the fiber intake was 2-fold higher in the WD group; and the percentage of saturated, monounsaturated and polyunsaturated fat in the diet were similar (47%, 30% and 23% in the KD and 48%, 34% and 18% in the WD group, respectively) - if that's relevant for the results is questionable, though. Unless, obviously, you believe in the myth of the tooth fairy... ah, I mean, the "anabolic prowess of saturated fats" that was born out of a single study showing increased testosterone levels on higher SFA-diets. Only recently scientists have been able to show that coffee can kickstart ketosis, even if you eat a sign. number of carbs for breakfast | learn more. The individual energy content was calculated based on maintenance calories determined by the Mifflin St. Jeor equation. Now, while this is standard procedure in metabolic research it is still problematic, as the equation can be 15% off the actual requirements. Accordingly, it is not clear, whether the subjects were in a caloric deficit. Since this holds true for both groups and the overall energy intake was identical in both groups, though, this is not relevant to the study's original research goal, which is to determine differences between a ketogenic and a western diet. What we can tell, though, is that the subjects' adherence to the diets was excellent (2608.6 ± 157.5kcal/day vs. 2549.5 ± 212.5 kcal/day, 217.02 ± 15.5 g fat per day vs. 83.4 ± 13.3 g fat/day, 133.6 ± 10.8 g protein per day vs. 132.2 ± 13.3 g protein per day, 30.9 ± 5.9 g carbohydrates per day vs. 317.6 ± 31.1 g carbohydrates per day in the KD vs. WD group, respectively) and confirmed by both both food logs and weekly urinary ketone measurements. Does the study "fly in the face of all other research" and present "totally unrealistic results"? That's at least what I read on Facebook several times - alongside accusations of scientific fraud that have no basis in facts, by the way. Let's take a look at the little research there is: There's the recent revelation that low carbohydrate dieting impairs the adaptive response to aerobic training in Louise Burke's excellent paper in the Journal of Physiology (Burke 2017); a paper, of which not even its authors would claim, though, that it settles the debate once and for all - neither for endurance athletes, of whom Cox et al. write that "five separate studies of 39 high-performance athletes" show that "this unique metabolic state [ketosis] improves physical endurance by altering fuel competition for oxidative respiration" (Cox 2016; further evidence e.g. Ball 1995; Gore 2001), nor for athletes competing in anaerobic sports, where studies studies in gymnasts (Paoli 2012), or dieting martial artists (Rhyu 2014) report favorable results with ketogenic diets. Comparison of the body composition changes in Jabekk 2010, a study in untrained overweight women w/out dietary restriction and the results Wilson et al.. report before the glycogen reload in week 11 that's obviously absent in the Jabekk study. Let's get more specific, though: If we exclude the effects of the glycogen reload (i.e. stick to the body composition changes from week 1-10) and compare these to the observations of a 2010 study by Jabekk et al., it also becomes obvious that the changes in body composition are not as "unrealistic", as some critics have claimed: With almost identical macronutrient compositions, i.e. 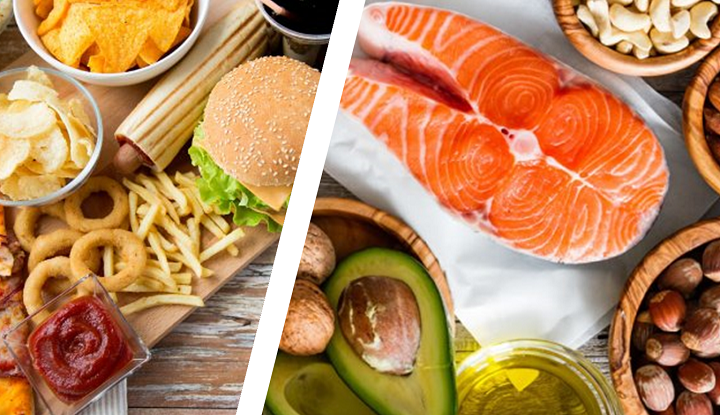 6%, 66%, and 22% in the "low carbohydrate" (de facto ketogenic) diet and 41%, 34%, 17% of the energy from carbs, fats and protein in the "normal" (de facto western) diet, Jabekk's study has a very similar dietary composition as the study at hand. Due to fundamental differences in the subject selection (untrained, overweight women vs. trained, lean men) and other aspects of the study design, including a non-restricted energy intake and non-hypertrophy-specific workouts, it should be obvious that the results of the studies cannot be 'identical'. Within the statistical margins of error (which are unfortunately not provided in Wilson 2017; that's also why the error bars are missing in the figure on the left) and in view of the previously mentioned design differences, Jabekk's results are yet similar enough to refute the claim that Wilson's study results were "totally unrealistic" or had to be discarded, altogether, because they would "fly in the face of all previous research" (my emphasis). The last-mentioned ketone tests confirmed that all subjects in the ketogenic dieting group (KD) had reached full ketosis at the beginning of the 2nd week of the two-week lead-in - an important observation that was not made (either because it was not tested or because the high protein content of the diet allow the subjects to reach full ketosis) in some previous "low carbohydrate diet"-studies. Figure 2: Changes in body composition (in the given timeframe in kg) according to DXA scans (Wilson 2017). So far, so good... I guess, it's about time to address the catch, then: Before the final DXA scans (results see Figure 2), muscle circumference and strength tests were done, the subjects in the KD group were subjected to a classic glycogen loading protocol consisting of two days on 1g/kg carbohydrates, followed by two days on 2g/kg carbohydrates and 3g/kg carbohydrates in the last 2 days before the DXA scan - obviously, with an isocaloric decrease in dietary fat that maintained the caloric intake at the previously described calculated maximum. In general, there's nothing wrong about this. To create a truly equal playing field, however, it would yet have been smarter to either glycogen-load (or, alternatively, -deplete) both groups. 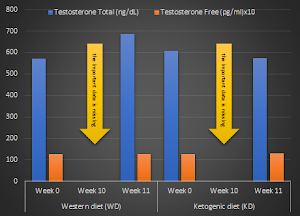 With only one group getting the extra boost in muscle fullness, however, the DXA data from week 11 is as skewed (albeit into the other direction) as the measures that were taken in week 10, when the emptied glycogen stores in the KD group gave the similarly elusive impression that the consumption of a ketogenic diet had impaired the subjects' lean mass gains while extremely augmenting their fat loss. Percent changes in leg lean and fat mass vs. baseline following glycogen depletion and creatine and glycogen loading with and without creatine (Bone. 2016) | learn more in my previous article about the study. Glycogen or real muscle gains? If you scrutinize the data in Figure 2, you will realize that the keto group was trailing 50% behind in weeks 1-10, i.e. while the subjects were actually consuming a ketogenic diet. Only after the increase in carbohydrate intake in week 11 that was not all-too-different from the glycogen loading protocol in a recent study by Bone et al. (2016), they caught up and overtook the western diet group. The ~2kg (~3% of baseline lean mass) extra lean mass in the ketogenic vs. western diet group, however, is pretty much identical to the 2.0 ± 0.9 % increase in DXA-measured lean mass Bone et al. observed in response to a similar glycogen loading protocol in their study. If we assume that the effects of the loading protocol were similar to those Bone et al. (2016) observed with an almost identical protocol in their recent study (see discussion in the red box, above), the extra glycogen would appear as a ~3% increase in lean mass on the DXA scans - and that's pretty much what we see in the study at hand. Accordingly, the "real" muscle gains in the KD group are probably somewhere in-between what we see in Figure 2 (left) for the 1-10 wk and 1-11 wk period. This, however, would imply that the "real" lean mass gains (and the increase in muscle thickness, see Figure 3) over the course of the study would - within the usual statistical margins of error - be identical for both diets. In view of the harsh criticism Wilson et al. have received over the Easter weekend, it should be mentioned that the authors come to a very similar conclusion (without, however, citing the study Bone et al. ), when they write in the discussion of their results that "the abrupt, yet not unexpected, changes in LBM were primarily driven by drastic changes in water flux during the last week of the study" (Wilson 2017) - and conclude, just as I did, that both "groups gained similar amounts of muscle mass throughout the entire study" (ibid.). Figure 3: Rel. 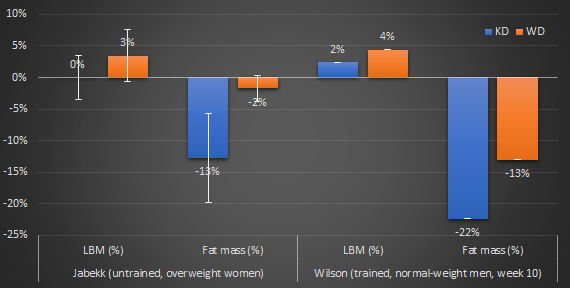 changes (%) in muscle thickness and performance data from week 1-10 and 1-11 (left) and absolute DXA data with lean mass at the top and fat mass at the bottom (full bars = KD, open bars = WD | Wilson 2017). The fact that the authors do not make this more explicit in the abstract and, even more importantly, speak of a body composition "advantage" for the KD diet in the "practical implications" section of the paper, is in fact reason for warranted criticism. After all, the alleged improvements in fat loss vanish just as the increases in lean body mass did, if we subtract the ~6% "virtual" loss of body fat Bone et al. observed as a result of glycogen depletion, alone, and/or estimate the "real" body fat loss by averaging over the fat mass Wilson et al. measured in week 10 and 11, respectively. If there's no inter-group difference, the study at hand still shows just what the first part of the conclusion of the abstract says: "The KD can be used in combination with resistance training to cause favorable changes in body composition, [and] performance" (Wilson 2017). So, even if we assume that the extra gains were an experimental artifice and assume that a potential fat loss advantage did not exist, we should at least be able to agree that the study at hand confirms, irrespective of its methodological problems and 'suboptimal' reporting of the results, that ketogenic diets can build the same amount of lean mass and strip the same amount of fat off the bodies of trained young men, when all other parameters are kept equal. Whether the "western diet", a high carb, lowish protein, medium fat diet, is an adequate yardstick when it comes to the question "What's the best diet for gymrats, physique athletes and/or bodybuilders? ", however, is yet another story. Figure 4: Despite all the criticism: There's one major problem with the study that has gone largely unnoticed: In the absence of data from the last week the subjects were actually consuming a ketogenic diet it is IMHO unwarranted to conclude that a KD "cause[s] favorable changes [...] in hormonal profiles" (Wilson 2017). So, keto-dieting rules, right? If we try to average the effects of the glycogen load out, the study at hand still yields an important result: it confirms that there is no body composition and muscle size disadvantage to consuming a ketogenic diet compared to an isocaloric "western" high carbohydrate, lowish protein diet. How's that? Well, due to the fact that the scientists' well-meant effort to level the playing field by restoring their subjects glycogen stores in week 11 backfired, it is impossible to say, whether the "favorable changes", Wilson et al. point out in the conclusion of the abstract were more or less pronounced in the ketogenic compared to the western diet group. What is possible, however, is to speculate based on data from before and after the glycogen-load. If we thus try to 'fix' the data by (a) averaging over the data from weeks 10 and 11, respectively, or by the means of (b) logical inference based on the results of Bone's previously discussed study that used an almost identical protocol to determine the effects of glycogen loading on DXA scans (Bone 2016), we will arrive at a conclusion that mirrors the one Wilson et al. phrase in the discussion of their results - that both "groups gained similar amounts of muscle mass throughout the entire study" (Wilson 2017); and that's, if we are honest, exactly what the first part of the heavily criticized and, as I believe, largely misunderstood conclusion of the study's abstract says: "The KD can be used in combination with resistance training to cause favorable changes in body composition" (Wilson 2017; my emphasis). Unfortunately, the person who wrote the "practical applications" section of the paper seems to have 'forgotten' about that when he wrote that the KD was overall "advantageous for body composition [...] as compared to a WD" (ibid; my emphasis). That's clearly not in line with the message that emerges in the authors' previously cited discussion of the results. What is likewise questionable is whether the study outcome would have been similar for the practically more relevant comparison of a ketogenic diet to a classic bodybuilding-style high protein, medium carbohydrate control diet - a diet with lower amounts of carbs and fats and significantly more protein than the unquestionably suboptimal "western" diet in the study at hand. 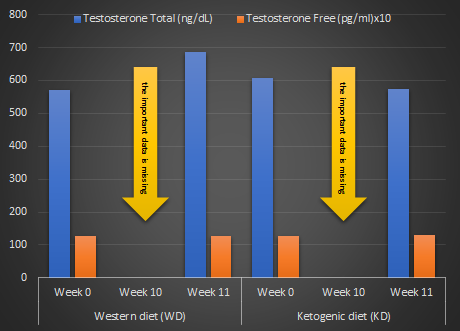 Ah... and one last thing: It is not just questionable, but, in my humble opinion, simply unwarranted to claim that the ketogenic diet had beneficial effects on the subjects' testosterone levels when the latter were assessed after one week of glycogen loading (cf. Figure 4) | Comment! Ball, Thomas C., et al. "Periodic carbohydrate replacement during 50 min of high-intensity cycling improves subsequent sprint performance." International Journal of Sport Nutrition 5.2 (1995): 151-158. Bartlett, Jonathan D., John A. Hawley, and James P. Morton. "Carbohydrate availability and exercise training adaptation: too much of a good thing?." European journal of sport science 15.1 (2015): 3-12. Bone, Julia L., et al. "Manipulation of Muscle Creatine and Glycogen Changes DXA Estimates of Body Composition." Medicine and science in sports and exercise (2016). Burke, Louise M., et al. "Low Carbohydrate, High Fat diet impairs exercise economy and negates the performance benefit from intensified training in elite race walkers." The Journal of Physiology (2017). Cox, Pete J., et al. "Nutritional ketosis alters fuel preference and thereby endurance performance in athletes." Cell Metabolism 24.2 (2016): 256-268. Gore, Christopher J., et al. "Live high: train low increases muscle buffer capacity and submaximal cycling efficiency." Acta physiologica scandinavica 173.3 (2001): 275-286. Jabekk, Pal T., et al. "Resistance training in overweight women on a ketogenic diet conserved lean body mass while reducing body fat." Nutrition & metabolism 7.1 (2010): 17. Paoli, Antonio, et al. "Ketogenic diet does not affect strength performance in elite artistic gymnasts." Journal of the International Society of Sports Nutrition 9.1 (2012): 34. Roberts, Michael D., et al. "A putative low-carbohydrate ketogenic diet elicits mild nutritional ketosis but does not impair the acute or chronic hypertrophic responses to resistance exercise in rodents." Journal of Applied Physiology 120.10 (2016): 1173-1185.